In the comments to my deliberately controversial previous post, it becomes clear that many set Hamilton's allegedly bad on-track behavior against the apparent inability of Massa to accept blame in any situation. Both viewpoints are debatable and I have had my say on Massa; now it might be opportune to turn the spotlight on Hamilton's misdemeanors, to see where his reputation for ruthless driving originates. To begin with, I must point out that I see no evidence for the unsportsmanlike and overly robust driving that Lewis is so often accused of. This is not helped by the fact that most who hold that view will state their opinion without ever giving any details of why they have come to that conclusion, as though it were so obvious as to be beyond dispute. Most often, when any supporting evidence is provided, it is Monza 2008 that comes up and the incidents with Mark Webber and Timo Glock. Other than that, I see only vague references to Hamilton's on track antics, as though they were too numerous to need identifying. So it seems that much of Lewis' reputation for robust driving stems from the two incidents at Monza and they are worth looking at closely, therefore. Unfortunately, Bernie has been at work and there are no videos on YouTube that show the events unfolding. I can only tell you what I saw and it will be up to you whether you agree or not (as it always is, I suppose). Taking the Webber incident first, the two drivers are approaching the chicane at the end of the starting straight; Hamilton has the inside and is on the racing line (which is considerably further to the left as we view it - the rain has dictated that this line dries quicker and offers more grip). As Hamilton begins to decelerate for the corner, he also moves right (again, the drying line has dictated that this is the best approach to the chicane); Webber stays outside and begins to draw level. This is the point at which versions differ. Some say Lewis forced Webber on to the grass but this is nonsense - Mark's tires do not leave the track until he enters the run off area for the chicane. Hamilton squeezes him, yes, but at all times leaves him room to stay on the circuit. Careful study of the video, if you have access to it, will reveal that Mark actually moves right to bang wheels with Lewis - and this is interpreted by the Hamilton haters as being an attempt by Lewis to shove the Australian off the track. Not so; Mark bounces off but not sufficiently to go off the track. Then Lewis turns into the chicane and Webber, having overshot his braking point, has no option but to carry straight on and use the run off area. What Lewis did was no more than all F1 drivers do when challenged from the outside of the corner - they squeeze the guy to the edge but (if they are being fair) allow him enough room to stay on track. I see Hamilton's actions as well within the limits of decency as understood in modern F1 racing, therefore. And so to Timo Glock, who so ironically was later in the year to be accused of allowing Hamilton through to claim a world championship. This time we are looking at the exit from the same chicane and Glock emerges from it immediately behind Hamilton. The Toyota proves to have better traction than the McLaren and Glock begins to ease up on the outside of Hamilton as they accelerate down the straight. Lewis moves over to close the door. The (unwritten) rules say that a driver may block a following driver provided that he does so only once. What gets the Hamilton haters in a frenzy is that Glock goes on to the grass as a result of Hamilton's move - he has been forced there, apparently. But, in fact, it was Glock's choice; he was presented with two options: either lay off the accelerator or go on to the grass. He chose the latter. The unwritten rules actually say that the driver in the lead may knock an overtaking driver off the track yet Hamilton did not make contact with the Toyota - he has been fairer than that. If we are to say that Glock did not have the option of easing off to avoid going off the track, how much more so is that true of Hamilton being forced to cut the chicane in Spa? And why are we not jumping up and down in rage at Raikkonen's identical squeezing of Massa on the first lap of the Belgian GP? The answer is simple: it is Hamilton we are discussing here and we are looking for anything that can justify our criticism of him. It does not matter that we have seen other drivers get away with far worse - we need fuel for the anti-Hamilton fire and anything will serve. I call the Webber incident as completely normal racing practice, the Glock incident I think was hard but fair by today's standards. But I also think that Hamilton's reputation stems from events much earlier than either of these events. It seems to me that it goes all the way back to last year, when the rookie Hamilton surprised us (and the other drivers) with overtaking moves that we had believed impossible. Time and again, it seemed that he could pass where no one else would dream of attempting such a move. That is fine as long as such moves pay off; but they depend on luck to some extent at least and, when the luck runs out, they can look as idiotic as the successful ones seem inspired. And Lewis' luck began to run out this year - instead of working, many of his moves began to fail. That is partly because the other drivers became more aware and so more likely to shut the doors that had never seemed open until Hamilton came along. But it matters not why luck turned against him this year. The fact is that, from being the wonder boy who could pass at will, he became as human as the other drivers and unlikely passing attempts became as risky as David Coulthard has demonstrated this season. In my view, Lewis has been the victim of his own initial success and has had to curb his more impetuous impulses increasingly as the year wore on. It may well be that the first corner incident in Fuji was the last optimistic move we have seen from Hamilton and that he will settle now into a rhythm of waiting for the best moment, rather than going impulsively for the first that presents itself. That is a shame in a way, for it will make him far less spectacular than he has been at times. But, if it is championships that we demand of him, that is the way he has to go. He does not deserve the reputation for knocking off drivers that has accumulated around him but, equally, this season has taught him lessons about staying out of trouble that will have added to his racecraft immeasurably. The young Vettel, so often cited as the greatest danger to Hamilton's dominance in the future, will find that he has a mountain to climb if he is to live up to those expectations. I think most of the criticism of Lewis by other drivers comes from jealousy. Drivers who ram other drivers off the road arrive in F1 with that reputation already in place. Senna had several debatable incidents with Brundle in F3. Schumacher had the well known incident with Hakkinen at Macau. Lewis arrived in F1 with no such reputation despite a long and successful junior career. Keke Rosberg who ran Lewis in karts and watched his career in detail. Anyone who knows Keke knows that the last thing he would stand for is someone ramming another driver off the road and had he seen anything like that in Lewis's driving he would have commented on it. Instead when Lewis was announced as a McLaren driver Keke went into great detail about Lewis's driving and his ability to cleanly overtake other drivers. One comment he made stunned me. He said Lewis is brave Gilles brave. Keke revered Gilles and for him to make a comment like that tells you everything you need to know about Lewis's driving. Gilles and Keke were hard men on a race track. Hard but fair. They would always give a driver racing room. That usually amounted to one car width and a few inches. This is a concept that was suppressed by Senna and bulldozed by Schumacher. Lewis is from the same mould as Gilles in that he is hard but fair. He can do things with a car that few drivers can dream of. As a result as a rookie he managed to drive Alonso out of McLaren and this season he has made Kovalainen look decidedly second best. He is the overtaker par excellence in current motor racing. His GP2 season produced two of the outstnding drives in motor racing history. First he dropped to 22nd in Turkey and made so many overtaking moves that he finished second. Then there was the magnificent move at Silverstone where he passed two drivers at the same time in the Beckkets complex. Despite all these moves some of which involved drivers leaving the track he arrived in F1 without a blemish on his reputation. I can think of no driver who had a reputation for unfair driving in F1 who did not arrive there with that reputation established. The fact that Lewis Hamilton arrived in F1 with a peerless reputation despite his long association with Mclaren tells you that his driving has always been fair. Another great piece. Conventional wisdom is generally wrong; the paradox is that it is its very "wrongness" - whether the result of over-simplification, deliberate and malicious distortion of the facts into a convenient narrative, or other factors - that helps it to gain currency. Towards the end of the season, even so excellent a television commentator as Martin Brundle had begun to allude to Lewis' "dangerous" moves as if they were a proven fact. IMO your only peer as a F1 blogger is Thierry Le Bras, who writes in French. Do you know him? He's currently doing an excellent series comparing today's F1 drivers with their antecedents of the recent past. He's a big fan of Kimi, and explores similarities between the Iceman and Mansell in the piece on him. Let me know if you'd like a translation. My French is a bit rusty but I'd give it my best shot. I feel you and Thierry are kindred spirits. Also agree with every single point Steven made in his response above. Steven: If Keke says it, it's good enough for me. The senior Rosberg was and is one of the most honest and realistic characters in F1. On his retirement, he said that he could never be as good as his team mate at the time, Alain Prost. That was, if anything, an underestimation of his own talent and it took no comfort from the fact that all the bad luck in that season had been his. Not many drivers have the ferocious honesty to assess themselves so severely and it says all we need to know about Keke's ability to assess others. Besides, I always liked him. And his opinion of Lewis Hamilton carries more weight than a hundred from those who seem to remember only the most recent race. the italian GP includes onboard from webber during the incident. It's a racing incident, basically. Hamilton should've given a bit more room given how hard the conditions were, but he certainly gave enough room. Flipper: Thank you for your extremely kind comments. I have looked at Thierry Le Bras' site and used Google Translate to give me an English translation of the piece on Hamilton. Any software translator is going to produce some strange results but they do at least give an impression of the piece. I agree that Thierry knows his stuff and his opinion is worth reading. I could of told you from here, play with Lewis after Spa at your own peril, To hear drivers cry about hes behaviour at Monza is the talk of pussies, and thats why he is WDC, and they are not. Mr Soap: Ah, thank you for that - I confess that it had not occurred to me to look at F1.com for suitable clips. Unfortunately, the Monza highlight video does not include the Glock incident and has only a very brief flash of the Webber one. What there is does confirm my view on it, however. Watch those wheels - they do not touch the grass! Gusto: Actually, I thought Hamilton was unbelievably brave in the Italian GP. He was fresh from the travesty of Spa and yet drove as though it had never happened. I would not have blamed him if he had been ultra-careful not to give the stewards any excuse for interfering - which would have meant driving like a granny. Oh come on, Lewis driving Glock onto the grass between Lesbos 1 and 2 is nothing to having your team mate drive you off the track in to Eau Rouge is is? Sorry Clive, all came out like I didn`t mean it too. Actually, I was thinking more of Kimi squeezing Massa as they hurtled down the Kemmel straight, Gusto. That is exactly comparable, although it's a bit much when it's your team mate doing the squeezing, as you say. I thought it also showed the Hamilton/Alonso overtake which many, Alonso included, said was too aggressive. But on another watch, it would seem I was mistaken, which is a shame, as I didn't pick up on it being at all wrong while watching live. For what it's worth, The spray during the Glock incident was probably sufficient that Hamilton would only have know where Glock was from sound, which is a whole lot less precise. As it stands Hamilton just took the standard racing line, which Glock woudl've had to have done a whole lot more to prevent him from taking. I can't help but feel that much of the Hamilton being over aggressive and unpopular is something crafted by selective quoting by many media outlets. I remember Webber being quite annoyed at being misrepresented when it came to talking about Hamilton, and they've also misrepresented Coulthards views on the matter too, unless his views have changed since writing his biography. I wouldn't mind betting they've made some other drivers views somewhat more one dimensional than they actually are. I think you're right about the media being very selective about which quotes they will use in their articles. They have newspapers to sell, after all, and nothing sells papers more than conflict. And so we can be told that "all" the drivers agree that Hamilton is too aggressive. All lies and jest.......spot on. I always thought that should be Max's theme song although I can't think why. Clive – Great article complemented with a great comment made by Steven. I agreed in each point about Lewis be hard, but fair. 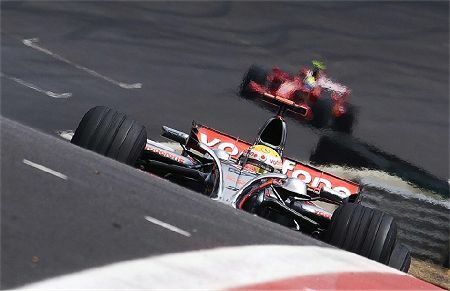 Steven has referred to this race at Istanbul in 2006 and that race is a great proof about Lewis´s manners in track and most of all, about his great talent as an overtaker. Once the authorities bring such scrutiny upon the drivers and the rules and come to such ridiculous conclusions you can expect every driver and team to start saying "sombody's gotta be to blame" whenever anything happens that prevents their own protegé from winning. Hamilton drove the way a world champion must drive in this era to win the title. Some believed he could be beaten by intimidation, on or off the track. They lost and Hamilton will most likely be stronger this year. My comment about preferring Massa to Hamilton was about on line persona. What we see is undoubtedly not who these people are away from the cameras and reporters. I think Massa has more experience in front of the cameras so sometimes looks a bit more polished. Then again he has not been in the same position Hamilton has since Stepneygate and the Alonso affair. I get the feeling that McLKaren's politics last year were at the beginning of the perceived arrogance. Becken: Thank you for both the kind comment and the link. That was one tremendous race and evidence of what Steven says about Hamilton being hard but fair. He always gave the other guy room, especially so in the fight with Glock (it also shows why Timo has a considerable reputation as a fighter). It was interesting to see so many of those now in F1 and compare them with their present achievements. I do not often get to see much GP2 racing so this was a special treat for - thanks again. Nick: Yes, I am too hard on Massa. But the post was a deliberate attempt to balance some of the extravagant praise being heaped on him now that the season is done and dusted. So I overstate the case to achieve some balance. I am not sure how much the politics of last year have affected Lewis. He has said very little about it, apart from his brief testimony at the hearing (and even that amounted to saying that he knew nothing). It seems to me that Ron Dennis did a pretty good job of keeping Lewis out of the whole thing and keeping his driver's mind on the racing instead. Thanks for the vid Becken. I have seen many clips of that race but never the full race before. I really have no idea how even Lewis can do that spec formula. Regardless of set ups how can anyone be over a second quicker with identical engines, identical chassis and identical aero? I have always believed Lewis is a special driver but in that sort of mood when he has nothing to lose he really is like Gilles and no-one else. Piquet for me has always been overrated and that race was a perfect example of his limitations. Apart from Premat who played the good team mate role every other driver bar one had no answer to Lewis. Glock really seems to be a better driver than I thought he was and I will make a point of watching him next season. His positional sense and his ability to hold up a faster car fairly was extraordinary. McLaren's policy of not having a number one and two driver and Hamilton's immediate quickness and challenging of Alonso had the effect of making him look arrogant in the eyes of many. The media and partisan fans jumped on this wagon as did some of the other drivers. Add that to being the crown prince of the "evil team" and you have a form of witch hunt. Accuse first; find the proof later. I agree that hamilton appears to be criticised where other drivers are praised. Kimi squeezes Hamilton out at spa (fairly in my opinion) but hamilton does the same to webber and suddenly it becomes dangerous driving. Kimi almost forces Massa from the track on the first bend and nothing is said yet hamilton makes a mistake at the first bend and again he is accused of dangerous driving! Alonso made a strange attempt to overtake on the inside of the hairpin at monaco and crashes yet no one mentions it - it was not dangerous as the speeds were too slow but he ended up taking himself and his opponent out of the race in a move which was only ever going to end in a crash. Lewis is not perfect and still has an huge amout to learn. But I think he is technically one of the best racing drivers I have ever seen and I think if he keeps his head together and learns from his mistakes he could potentially become one of the greatest drivers to grace a track. Watching him slide that maclaren around Monaco keeps me captivated in awe. Agreed, Lee - on tracks where precision is required, Hamilton is a joy to watch. He scares me with how close he comes to barriers at Monaco for lap after lap. And as for coming off the banking at Indy and leaving a few millimetres between the tyres and the wall - well, no one else dared come anywhere near as close. He is undoubtedly an exceptional talent. Interesting thought, Rob. But it depends on whether Hamilton is able to establish a Schumacher-like superiority and I don't really see that happening. There are too many others who can challenge him out there - Alonso, Kubica, Vettel, etc.